Brookwood Military cemetery is one of my favourite places and i made another visit there last weekend.I particularly wanted to spend more time wandering around the American and British Commonwealth sections which i had neglected to do on a previous visit. 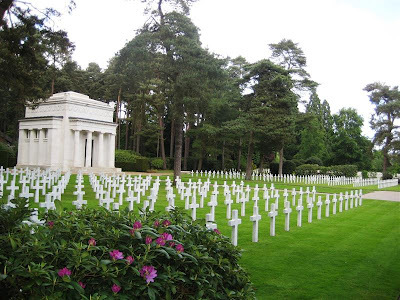 The American cemetery is set amongst beautiful woodland. 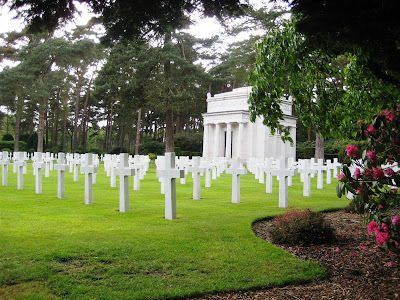 The American Cemetery is the only American Military Cemetery of World War 1 in the British Isles. 468 war dead of the USA rest here. 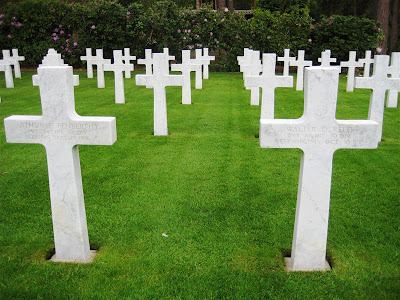 Most of those buried died in Great Britain or it's surrounding waters. They include victims of the SS Tuscania which was sunk by a German submarine on February 5th 1918 off the west coast of Scotland. Additionally, the names of 563 Americans who gave their lives in the service of their country and whose graves are at sea are inscribed on the walls of the chapel. Most served with the United States Navy or United States Coastguard including 114 from the US coastguard cutter TAMPA which was also sunk by a German submarine in the Bristol Channel on September 26th 1918. The construction and care of this 4.5 acre site is the responsibility of the American Battle Monuments Commission, an agency of the United States government. 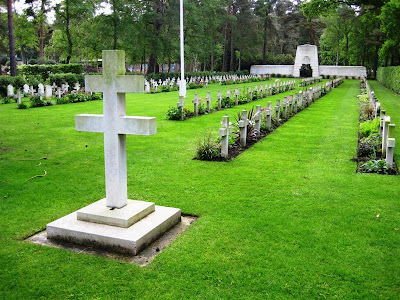 The adjacent World War 1 and World War 2 cemeteries and monuments were developed and are maintained by the Commonwealth War Graves Commission. The gravestones of Privates Penberthy and Reed. I always find walking among the gravestones quite poignant. Looking at the inscriptions i wander who was Private Arthur E Penberthy of Illinois or Private Walter D Reed of West Virginia? What are their stories. What did their families go through when the learnt of their son's or brother's death in a war thousands of miles away in a foreign land? A distant view to the American Military Memorial Chapel. 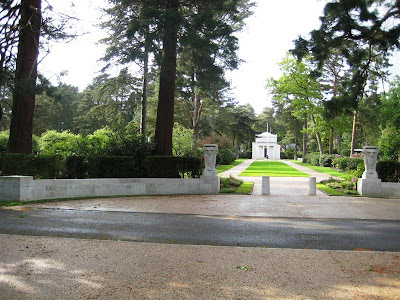 I walked further until i was in the Commonwealth part of Brookwood Military Cemetery. 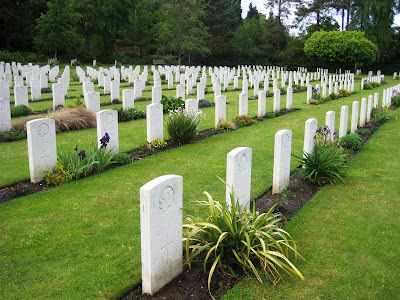 Here there are graves of hundreds of British, Canadian, South African and Indian soldiers from both world wars. This section i find most moving, not only because of the beautifully kept and verdant grounds, but because reading the incriptions of the dead servicemen reminds me how young these brave men were. Most were only in their early or mid teens. Along each row are small flowering plants and shrubs. Row upon ro w of war graves. In the British cemetary it really re-inforces how young these men were and what responsibilities they had on their young shoulders. Just two examples i noted from the inscriptions. 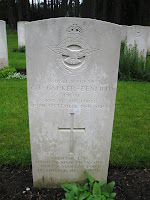 The first read "Sergeant G. F. Barker-Benfield, Pilot, Royal Air Force. Died September 1941. Aged 19". 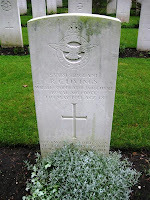 The second read "Sergeant R. C. Livings, Wireless operator/Air gunner, Royal Air Force. Died May 1941. Aged 18. These were just two of hundreds buried here. Again, what are their stories? It made me shudder to think that two of my children are these ages. All they appear worry about is their Facebook page, computer games, clothes, and having a good time. Just two generations ago boys of their age were fighting for their lives on a daily basis. How or indeed would teenagers cope if called upon to fight for their country? 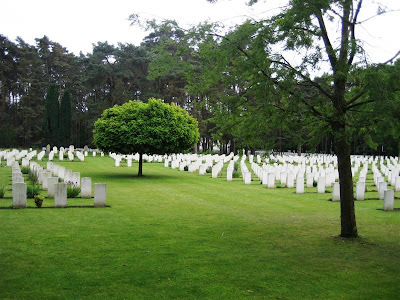 The Free French Forces cemetery.